Considering the right to preserve the life of a person is paramount, the Supreme Court on Monday allowed a 22-year-old woman to terminate her 24-week pregnancy on medical ground. Supreme Court it will summon secretaries of several states to appear in person with files if the states concerned did not file status reports within four weeks pertaining to installation of speed governors in public transport vehicles. 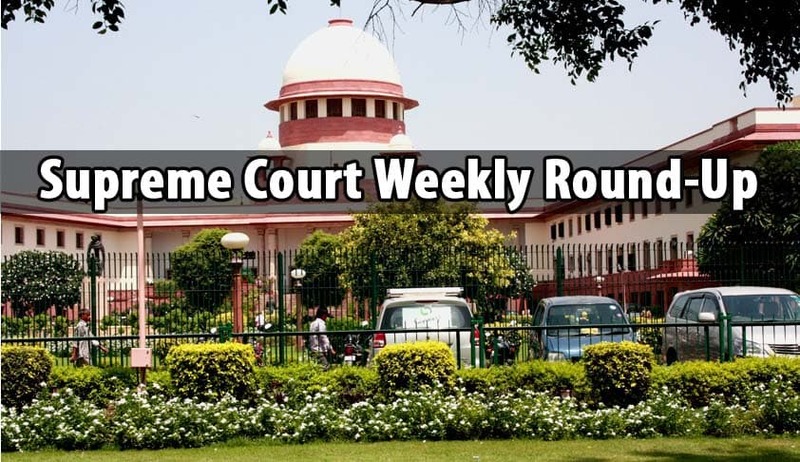 The Supreme Court has said it is unfortunate that the Uttar Pradesh state authorities were not able to execute the non-bailable warrant of arrest issued by the court against a person who repeatedly violated the court orders. The Supreme Court bench of justices DipakMisra and R.Bhanumati on January 12, allowed the Delhi High Court to hear the petition filed by SonuSardar, a death-row convict, lodged in Raipur Central Prison, against the rejection of his mercy petition by the President. In a ruling that would have bearing on the issue of divorce granted by any entity other than courts recognized by the Constitution, the Supreme Court on Thursday said decrees granted by the ecclesiastical court, known amongChristians as church courts, have no legal sanctity. Merely because the wife is ‘capable of earning’, it is not a reason to reduce the maintenance awarded to her, the Supreme Court has held in a recent pronouncement in Shailja vs. Khobbanna. The Supreme Court has acquitted one ‘Killer Thiayagu’ of murder charges, reversing the concurrent findings of trial court and the Madras High Court which had held him guilty for murdering a real estate broker. Six persons, one from Delhi and five from Kerala, were acquitted by the Supreme Court of murder charges by setting aside the concurrent findings of respective high courts and trial courts. The Supreme Court bench of the Chief Justice J.S.Khehar and JusticeD.Y.Chandrachud, on Friday, stayed the Himachal Pradesh High Court’s July 29, 2016 judgment directing the Centre to enact law prohibiting slaughtering of cow/calf, import or export of cow/calf, selling of beef or beef products, at the national level. The Supreme Court has set aside an order of Madhya Pradesh High Court that initiated an inquiry against BJP MP Kailash Vijayvargiya into allegations that he had submitted false affidavits to the court. The apex court remanded the matter back to the high court for fresh consideration. A lady got released from prison after 13 years of a trial court sentencing her to life imprisonment for the crime of killing her own daughter, following intervention by the Supreme Court.